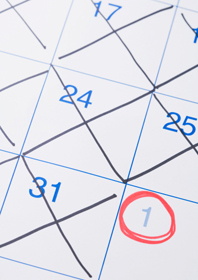 College applications come with a few different timelines and common due dates. Most prospective students apply for regular admission—usually, that’s January 1 of the year in which they plan to begin their undergraduate studies. Colleges and universities typically send their decisions sometime in April. This method gives you a lot of time to put a lot of effort into your college application and produce a thoughtful piece of work. However, this is also when the majority of applicants submit their materials, so you really have to make yours stand out if you want to be noticed and not lost in the shuffle. Remember: a standout application is eloquent, but concise; free of errors; and filled with memorable, unique stories. Students who can’t wait to get their foot in the door have the option of applying through early admission. There’s nothing wrong with applying early—you just need to be organized and prepared, often long before your regular admission peers. The term “early admission” typically encompasses two different paths: Early Decision and Early Action. They sound the same, but they’ve got some major differences! With Early Action, you apply to a college or university with a typical deadline falling around November 1; some schools go as late as November 15, some as early as October 15. You will hear back from the school in early December. You can apply to as many schools Early Action as you want, because the application is non-binding. Even if you’re accepted to many schools through Early Action, you can pick and choose among them to find the one you think is best for you. Although the timelines are very similar, Early Decision applications are binding, meaning if you are admitted, you must attend the school. You should go the Early Decision route only if you have a clear top-choice school that you are sure you would attend if admitted, no questions asked. And remember, you won’t get your financial aid package until the spring—after you’ve committed. A third, and relatively new, early admission option offers a compromise between these two; it’s called Single Choice Early Action (SCEA). With SCEA, you can submit a non-binding application to one college or university early; however, you cannot apply early to any other schools, whether it be Early Action or Early Decision. You can apply to other schools regular decision. You then have until the regular decision deadline to make your choice. SCEA guarantees you will have an early admission decision from that particular school. Finally, a large number of schools offer rolling admission. This gives you a wide timeline in which to submit your application, typically over six months. Once the admission committee has all your materials, they will make a decision in a few weeks and get back to you. Rolling admission gives students a chance to really take their time and not stress about the application process, but there are a few things to keep in mind. Spaces in the freshman class fill up on a first come, first served basis, so if the school is one of your top choices, don’t put off applying until late in the season. And some schools still have application deadlines for particular programs, like physical therapy or pre-med, even though they have a general rolling admission. If you already have a major in mind (especially in the health sciences), double-check to make sure it doesn’t have a unique application deadline. “Students should consider an application as an extension of themselves,” says Thomas B. Hassett, Director of International Admissions at Gannon University in Erie, Pennsylvania. “The presentation that is made on an application suggests an applicant’s interest in both the process and the university.” Applications have many different parts that need to come together to form a complete and consistent view of who you are. “Of all the requirements and criteria that are needed in the admission process, the one item with which a student has complete control at the time of making application is the application itself,” Hassett says. From the essay to the interview to the application itself, the college admission process can take many forms. One of these forms is The Common Application. It’s an application you fill out once and send to multiple schools, making your life a little easier! Four hundred and fifteen schools accept The Common Application, so there are bound to be a few on your list that take it. Be careful, though—many schools require additional materials to supplement The Common Application, like institution-specific personal statements, and your application won’t be reviewed until everything is received. As always, make sure you check each school’s website to be sure of what they need from you. If you’re applying to a music, art, or design program, your application might take a creative turn and require an audition or portfolio. Auditions and portfolios show admission officials that you can handle the rigorous course work and have the talent to succeed in their program. Art portfolios need to give admission counselors a glimpse of what makes you unique; they should be able to look at your work and get a sense of who you are and what’s important to you. “If you’re drawing or painting a still life, assemble things that really interest you,” says Jeremy Spencer, Director of Admissions at Alfred University in New York. “That way, it will be easier for you to spend a lot of time looking at the subject while drawing it and we’ll have a better idea of who you are. If you express your personality and interest in your work, you won’t just blend into the crowd.” The Cooper Union, an arts, architecture, and engineering college in New York City, requires its art and architecture students to submit a portfolio and complete a home test. The home test includes a few projects that should be completed in three to four weeks. Portfolios consist of about 20 pages of students’ original work, showcasing their talent and revealing the very best they can do. Though you should not limit your search based on cost alone, it is helpful to know what the typical aid packages are at the schools you’re applying to. Early aid estimators, like the FAFSA4caster, can provide you with a projected amount that reflects what your federal aid may be. It is also beneficial to know whether a school is need-blind or need-aware. Need-blind is when a school considers your application without knowing whether or not you need financial aid in order to attend. Some schools are need-blind and also meet full demonstrated financial need. Need-aware schools take financial aid into consideration when admitting applicants.